On New Year’s Eve, I had this great idea to buy Chinese wishing lanterns and release them on the beach in a peaceful, beautiful ceremony to ring in 2016. It turned out to be (thanks to a very windy evening) a chaotic, unsuccessful attempt at serenity that left my brother with a few less eyebrow hairs and nearly set the northern half of Miami Beach on fire. We walked back to our house physically defeated, my children screaming “are we going to be sent to jail? !” and with a pack of unused lanterns in tow. The festival is Nov. 5th in Eureka. Come and enjoy food, live music, a stage show, familiar princesses, face painters, s’mores, balloon artists and more. Then, at dusk, every adult sets off a lantern and boundless photo opps and ooo-ahh moments begin (as is evidence from these photos from Lantern Fest events around the country). Buy your tickets HERE and use code CARADISEFOUND at checkout to recieve 20% off your purchase. See you there! If you follow me on Instagram, you’ve seen me wearing my Boho Betty wrap bracelet. I like to think of these guys as Chan Luu at a price. Most are under $50 but look like their more pricey competitor. I wear mine like a watch – meaning always. They are having a great sale so thought I’d share. Shop thru THIS link and get 30% off and free shipping with code LOVE30. Above is the one I currently own and below are some that I have in my bag. Happy Monday! If you’ve been with me since the beginning, you know my love/hate (but mostly hate) relationship with the fiddle leaf fig tree that resides in the southeast corner of my living room (the saga is here). These trees are gorgeous when they come off the delivery truck, then within weeks in my care, turn to this. If you’re counting, I’m on my second tree in less than two years and it’s recently hit rock bottom. When we came back from vacation, there were 12 (exactly one dozen) leaves scattered on the ground around my tree. I unlocked the door and screamed so loud upon seeing the carnage that my husband thought we’d been robbed. And as such, said tree currently stands in my living room. 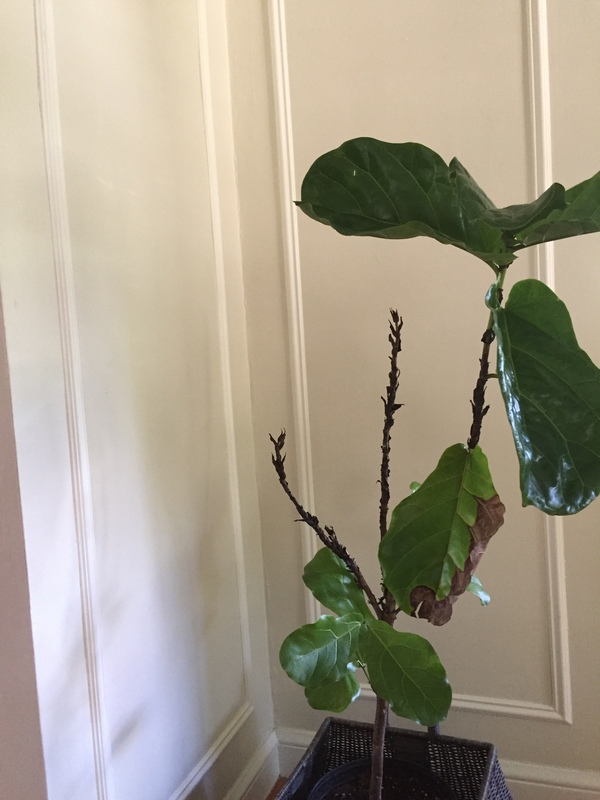 A brown, twig-like form that is definitely bringing down the mojo of my entire first floor. It’s got to go. But as this buy/kill/buy/kill routine is getting to be a very expensive habit, I’m rethinking getting another live tree and instead considering a faux option. Tacky I know, but I really need something green in my house, this corner in particular. Below you have the best options I’ve found. They are not the cheapest, but the most attractive and real-looking in my mind (plus, I’d have spent this anyway in roughly 36 months given the current pace at which I’m killing the live ones). The second option below is a bar cart I’ll top with vase and fiddle leaf limbs that I think could serve the same purpose and also add some utilitarian value. Whatdayathink? I suppose I could also crowdsource and try to muster up funds to replace a new, live one every 9 months. Are you feeling generous? We stumbled upon the St. Louis Artists’ Guild this winter when I read that they offered free art projects for kids the first Saturday of every month. In need of a cold weather weekend activity, we became regulars at the Guild (which is somewhat of a hidden gem in town, and has been cultivating the arts and artists for over 125 years). Last week, the Guild had an opening for their new photography exhibit: Illuminating the Night. The idea: how photographers use natural and/or artificial light to take pictures after the sun goes down. The concept especially resonated with me, as taking pictures for this blog has taught me the importance that light plays in making or breaking a photo. Taking a good picture at night is particularly difficult. The artists in the show were from all over the country and their photographs ranged from sunsets in St. Louis to the people at Mardi Gras illuminating by the street’s artificial neon lights. We were in Nashville for Memorial Day weekend. It was my first time there, even though St. Louis is an easy 4.5 hour drive away. If you’re headed that direction anytime soon, I’d highly recommend the following: Barista Parlor for coffee, Pinewood Social for a lazy Sunday reading the newspaper and noshing on a boozy brunch, and Bastion for before- dinner drinks. But since this is more of a fashion blog than a food blog, thought I’d share some details about Nashville’s most famous export and her clothing line. Yes, I’m talking Reese Witherspoon and Draper James. The brand has it’s only brick and mortar store in Nashville’s hip 12 South neighborhood. The clothing felt a little drunk-on-sweet-tea to me, with lots of seersucker and eyelet…like together on an article of clothing (example is here). Don’t know about you, but I’ll take either seersucker or eyelet, but usually not both at once. That said, there were adorable things for the home…like these melamine plates and these guest towels. Maybe you remember the last time I wrote from the Contemporary Art Museum (CAMSTL) ? There was a living sculpture in their courtyard by New York designers, Nomad Studio. And now, Nomad studio is back with another living installation. This time, instead of on the ground, the plants are hanging from the museum’s trellis, mimicking the wavy shape of it’s predecessor. The installation is comprised of air plants – real plants (that look like succulents to me) that can survive without water or soil…they live off of the oxygen in the air and receive enough water from rain and dew that is naturally occurring in nature. The inkjet prints of Holly McGraw. 48″ x 36″ each. The prints themselves are cool, but the striped walls they’re hung on that match the background of the photo make them even cooler. Pretty sure if you buy these, you’d also have to paint your walls to match.